Church Visits | J.W. Wartick -"Always Have a Reason"
Visiting Churches: Non-Denominational? Or not? 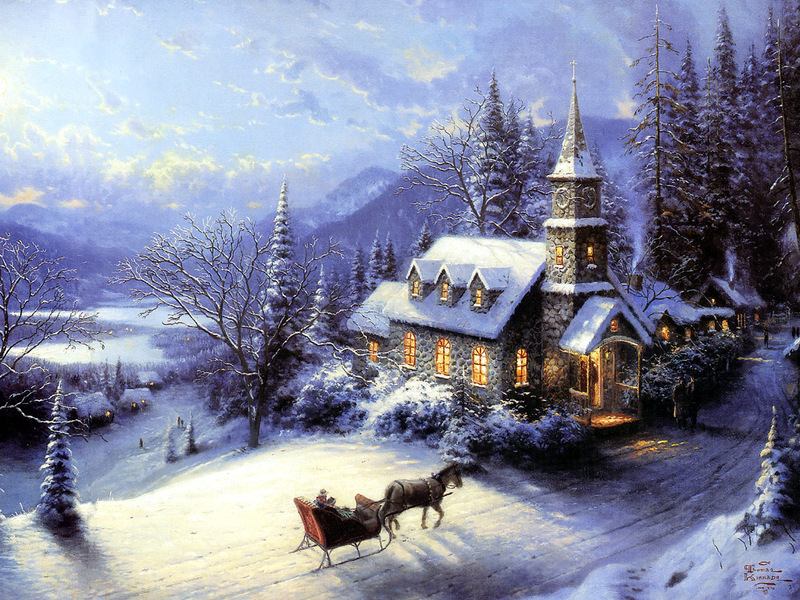 Copyright Thomas Kinkade; this image just made me think of going to church this past Sunday–cold and snowy. Over the course of this year, my wife and I, along with some friends, have been visiting a number of different churches in our area (there are many). The reasons for this are manifold, but primarily because we want to use it as a learning experience to see how other church families function, what works, what doesn’t, etc. I have lots of pastor friends/studying to be pastor friends so this is the kind of thing we do for fun! I’ve decided to offer up little reviews of the experience. I’ll not be naming the churches unless it would be made obvious by a comment (we’re planning, for example, to visit the St. Paul Cathedral). On November 16th, my wife and I ventured out on our own for the experience and visited a local non-denominal (maybe–more on that bit later) congregation that I’d been interested in for some time. Their site also hosts a Japanese service and I thought it would be interesting to see what the church was all about. The web site made it seem possibly Reformed/Calvinist as it used the word “sovereign” for God a lot. I love that word for God (as a Lutheran), but I know that Reformed/Calvinist traditions tend to focus on it as a primary descriptor for God (not saying this is bad, just an observation). Anyway, the members were extremely welcoming. More than any other church I think I’ve been to for the first time. We were greeted at the door, as we hung our coats a member came to introduce herself and ask about our family and whether it was our first time there and to tell us about the church, another family introduced themselves and seemed quite genuinely pleased to have us there, and throughout the time after the service many others came to say hello and greet us. That was a major positive takeaway: we are not greeting well enough! I think it is vitally important to have the assembly be a place in which newcomers are immediately made welcome into Christ’s body. The service consisted of several songs at the beginning interlaced with very brief prayers. The music was contemporary and lyrically fairly robust. Then there was an offering following a video on the current giving program and the children were dismissed for “Children’s Church” and the sermon/message began. This message was about 1/2 hour long and was on Ephesians 1:1-6. It was followed by two songs and a dismissal. The offering song seemed a bit manipulative, to be honest, as the lyrics–written from the perspective of Christ–were basically “I came down from heaven; what did you do for me?/I bled and died for you; what have you done for me?” etc. Ouch! The sermon shattered my notion that the church might be Reformed/Calvinist as it was about how Ephesians 1:1-6 teaches that God doesn’t choose those who are condemned but that we choose to be chosen. A quote from D.L. Moody was proffered: “The elect are the whosoever wills; the non-elect, the whosoever won’t.” Yep, not Calvinist. I appreciated, however, the clear attempt to adhere to Scriptural teaching and to make it the norm for faith and life, despite my disagreeing with the interpretation happening (largely decision/choice theology). They had “Children’s Church” in which all the children under 12 or so years old went to a different room to have some kind of Sunday School (I only observed in passing on way to nursery with Luke, my son). What are thoughts on children leaving for something like this? I admit I’m not a huge fan because it felt like we’re saying children aren’t a part of the body of Christ until a certain age or that if they’re noisy or something they’re distracting. I think that having children as part of the Divine Service is a blessing for both us and them. But I don’t want to over this without other voices. Do you have experience or thoughts related to a practice like this? I’d love to read them. Overall it was an interesting experience. I haven’t really experienced much non-liturgical styled worship and this made it feel as if I had missed something. The welcoming was wonderful and really set the pace for the rest of the experience. Also, the church never clearly made it seem like they were part of a denomination, but apparently they are part of the Christian and Missionary Alliance, a denomination founded in 1887 (according to Wiki). I know effectively nothing about this denomination, but there it is. Have you visited churches recently? What was your experience? Do you have thoughts on “Children’s Church”? What are they?